POHAKULOA TRAINING AREA, Hawaii – Army officials are offering an opportunity for young hunters to hone their skills, here, over the weekend. Youths ages 10 to 15 are invited to participate in bow hunting of pigs, goats and sheep, April 23-24, from 6 a.m. to 7 p.m. 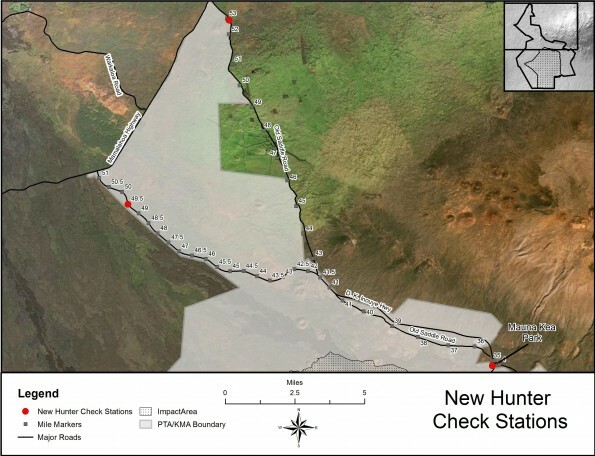 Hunting will be open in the Humu’ula Unit (training areas 1-4) and Menehune Unit (training areas 5-6). Adults can participate in a mentor capacity, only, and are not permitted to harvest any animals during this hunt. All youth hunters must have a valid State of Hawaii hunting license, and must be accompanied by an adult with a valid state hunting license. Reservations for the special youth hunting opportunity will be taken by text message only, from noon April 20 through noon April 22. Text the youth hunter’s name, hunting license number, and preferred day (Saturday or Sunday) to (808) 315-1545. One reservation per youth hunter will be permitted for this weekend’s hunt. A maximum of 20 youth hunters will be allowed each day. Call the PTA Game Warden at (808) 798-6944 to check on additional availability after 2 p.m., Friday. Hunters who are registered with the PTA iSportsman service can check in and out, and report their harvest online at pta.isportsman.net. Those not yet registered in iSportsman, must check in and out at the Army’s check-in station at Old Saddle Road Gate, across from the Mauna Kea State Park entrance. Additionally, hunters with disabilities can call the PTA Game Warden at (808) 798-6944.